This post has been published by me as a part of the Blog-a-Ton 50; the fiftieth edition of the online marathon of Bloggers; where we decide and we write. In association with ?Soulmates: Love without ownership by Vinit K Bansal. To be part of the next edition, visit and start following Blog-a-Ton. He fell in love the moment he saw her across the factory floor. She was a new joiner in their garment factory. Few days went by while he made up his mind to talk to her and slowly they became friends. It wasn't long before he expressed his love for her and she gladly accepted. They both loved each other a lot. Soon they were married, they were Soulmates. Their life was perfect although they weren't very rich but they were content with what they had and happy with each other's company. But as we all know God can't accept happiness of good people, tragedy soon struck them. It was a usual day in their factory and everybody was busy in their work when their town was struck with an earthquake and their factory building collapsed, trapping most of the people inside. Many buildings collapsed and there was chaos all around. Soon rescue operations began and people started helping each other shifting rubble to find survivors and finding dead bodies. There were many happy stories as people were found alive despite all the destruction. Few hours later, the cleanup work was still going. A rescue worker shifted another slab and his eyes popped out of their sockets, he called his colleagues to see and everyone who looked couldn't stop themselves from crying. A photographer came and captured the pictures and immortalized their love in the picture. Even in death they didn't leave each other. They died hugging each other and he trying to save her. Millions of people saw that picture and no one was left unmoved by what they saw. They were lovebirds, they were Soulmates. 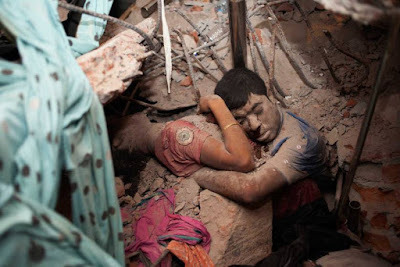 Note - This short story in inspired by the pic below which was clicked by Taslima Akhter after the Bangladesh earthquake. For me they epitomized the word Soulmates. Thanks Khushi, as soon as I read the title for BAT-50 this was the picture and the story which came to my mind. Tragic story.. but well written! Thanks Aativas but then all great love stories are tragic. You have given meaning in true sense to the picture by your words. So deep and so thoughtful ! Thank you very much Sonal. Comments like yours keep me going. It was a good read Vikas. Thanks Megha, I am glad you liked it. Its the picture that makes the story sadly beautiful. Thanks Aishwarya, I had to include the picture because that picture was the one which planted the story in my mind. Even in death, they did not part. Powerful one. That was so moving and beautiful Vikas! Even in death they are together. Truly soulmates. A beautiful story inspired by an amazing picture. Thank you very much Alcina for taking time to read my story.